Introduction: The land where Christ was born and where he died fell into the hands of the Moslems in 638 and remained in their possession until the First Crusade. Although Moslems were in control of the Holy Land, the holy places of Palestine were not inaccessible to Christians. Individual and organized group pilgrimages to the Holy Sepulchre took place throughout the middle ages, particularly during the eleventh century. The best recorded pilgrimage is that of the Germans in 1064-1065, organized and led by Bishop Gunther of Bamberg. Not only pilgrims, but also merchants from almost the whole of Western Christendom went to Palestine before the Crusades to do business with merchants from the East. By the eleventh century, then, a rather impressive concourse of peoples from the East as well as from the West could be found in the Holy Land. Since journeys to and sojourns in Palestine ware for the westerners expensive undertakings, it is little wonder that many of the travelers to the Holy City ran out of funds before they had completed their visits to the holy places. A pressing problem, also, for the pilgrims in Jerusalem was accommodation, especially for those who became sick. To provide help to pilgrims in the Holy City Pope Gregory I, as early as 603, established in Jerusalem a hospital or hospice for the support of poor pilgrims. Charlemagne founded a hospital in the Holy City for the care of Western pilgrims. The increase of traffic to the Holy Land in the eleventh century brought new foundations. At Jerusalem a complex of religious houses was established in the quarter of the Holy Sepulchre where, in mid-century, Amalfitan merchants founded, or restored, the monastery of St, Mary of the Latins and filled it with Italian Benedictines. To deal with the swelling numbers of pilgrims two dependent houses were established, the convent of St. Mary Magdalene, by 1080, and a hospice, dedicated at its foundation either to St. John the Almsgiver or to St. John the Baptist, possibly by 1080 or soon thereafter. At the time of the fall of Jerusalem in 1099 a certain Gerard, possibly a lay brother of St. Mary of the Latins, was administrator of this hospital of St. John for the sick poor. Some time thereafter, at an undetermined date, the Hospital became self«governing with Gerard (d. 1120) as its first Master. With the establishment of the Latin Kingdom of Jerusalem in 1099, the Christians were faced with the problem of protecting the hordes of pilgrims arriving in the Holy Land. 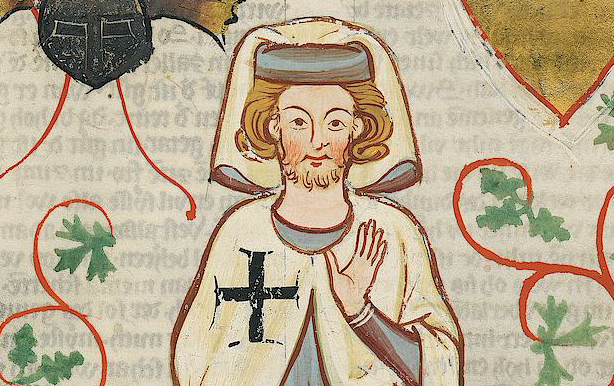 Thus a knight from Champagne, Hugh of Payens, together with a certain Godfrey of St. Omer and six other knights, decided to band together for the protection of pilgrims on their way from the port of Jaffa to Jerusalem. In 1118 King Baldwin I turned over to them lodgings in the area of the Temple, where they settled and became known to their contemporaries as the poor Knights of the Temple.